The University of Illinois at Urbana-Champaign is located almost at mid-way between St. Louis, Missouri, and Chicago, Illinois. About 1928 the school year was divided into two terms of twenty weeks each, and with the Chrismas Week as the longest vacation within the school year. Leon H. Epstein attended the University of Illinois fall term 1928. In the yearbook of 1932 he is presented as a student of Liberal Art and Sciences - English; and member of Zeta Beta Tau[footnotes 1] [footnotes 2], Pi Delta Phi[footnotes 3], Kappa Phi Sigma[footnotes 4], The Daily Illini (1, 2, 3) and Honors[footnotes 5] Day (1, 2, 3). In 1929, 1930 and 1931 Leon H. Epstein recieved Honor the High Scholarship and graduated in 1932 with Degree of Bechelor of Arts in Liberal Arts and Science with Honors in English. At the university Leon H Epstein soon became part of the Hillel Foundation[footnotes 6]  and beame part of the Hiller Players. On April 6 1929 he was Gratiano in "The Lady of Belmont" St. John Ervine's humorous sequel to Shakespeare's "The Merchant of Venice". He acted as an open forum speaker (Max Yeastman) in "Hillel in Sham Pain", a student-produced movie presented Mothers Day (May 12, 1929). The movie dealed with the building of a new foundation quarters. The last year he was with the Hiller Players he acted as a poet in the play "Adam" by Ludwig Lewisohn on March 5, and on April 15 and 16 as Bezano in the play "He Who Gets Slapped" by Leonid Andreyev. The Hillel Post (1929-47) was the bi-weekly newsletter (sent by mail) of the Hillel Foundation, and at the University of Illinois it was sponsored by the B'nai B'rith. The Hillel Post contained news articles on foundation activities, calendars, columns on social, dramatic and sports activities, editorials, notices of religious services and celebrations, and advertisements. Leon H Epstein was the editor-in-chief for the Hillel Post a year and a half before stepped down from its editorship early 1931. No short stories with, or drawnings of, anything reminiscent of Mandrake or comics by Leon H Epstein are to be find in the Hillel Post. Lee H Epstein became a member of Zeta Beta Tau on March 10, 1929. He joined Kappa Phi Sigma in 1930 and Pi Delta Phi in 1931. The Daily Illini is a student-run newspaper that has been published for the community of the University of Illinois at Urbana-Champaign since 1871. Leon Harrison Epsteins was one of the night assistants for The Daily Illini from October 6, 1928. In 1930 he became one of the junior news editors on September 10 until October 11. He was mentiones as one of the campus staff in 1930, 1931 and 1932, and all his signed articles are related to campus. December 13: "Faculty Actores' Comedy Piece Well Portrayed", review of the play "The Silver Cord". No short stories with, or drawnings of, anything reminiscent of Mandrake or comics by Leon H Epstein are to be find in The Daily Illini. ↑ The objective of the Zeta Beta Tau Fraternity (still currently in action with 90 chapters and colonies in the United States) is to develop, among its members, awareness and social responsibility as well as individual integrity. Founded in 1898, it was originally destined to the Jewish community before to be opened to a larger student brotherhood in 1954. At the time of the Lee Falk’s membership, the fraternity Chapter house (Rho Chapter established in 1912) was located at 907 South Fourth Street, Chicago. ↑ Interesting in 1932 his brother, Leslie, was one of the freshmen in Zeta Beta Tau. ↑ Pi Delta Phi was founded as a sorority at the University of Chicago in 1906. In 1932 there was eight active chapters including the Epsilon Chapter (from 1927) at the University of Illinois. It looks like Pi Delta Phi Epsilon chapter had both male and female members from 1929. The object of the Pi Delta Phi was: "To improve scolarship, and to promote an interest in the field of French Language and literature". ↑ Kappa Phi Sigma was founded at the University of Illinois in 1867. 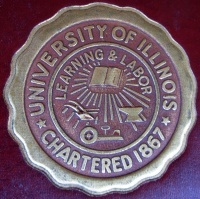 In 1932 there was ten active chapters including the Philomathean Chapter at the University of Illinois. The object of the Kappa Phi Sigma was: "To develope cogency of thought and personal power by public speech and contact of personalities, and to stimulate cultural activities." ↑ Honors were divided into two groups: superior and high. The superior group in the upper three classes was composed of the three per cent while the high scholarship students were those in the upper 10 per cent. This page was last edited on 18 April 2017, at 17:45.